Gelair™ Coil and Duct Industrial is specifically designed for industrial application in air conditioning and ventilation systems to clean and sterilise air conditioning cooling coils and ducts. 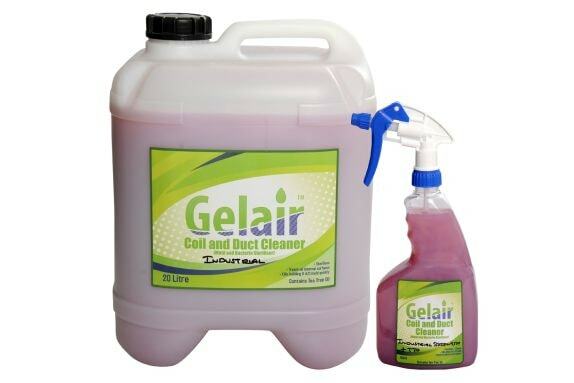 Gelair™ Coil and Duct Industrial is a pink, water-based solution of emulsified detergents/surfactants, humectant, rheology modifier and Pure Tea Tree Oil. It has been formulated with a higher viscosity enabling it to be sprayed on vertical surfaces where it can remain for long periods adding to its powerful sterilising and cleaning properties. The Pure Tea Tree Oil in Gelair™ Coil and Duct Industrial acts as a powerful steriliser, killing mold and bacteria on contact. Pure Tea Tree Oil also acts as a solvent, capable of dissolving oils and fats making Gelair™ Coil and Duct Industrial a powerful cleaner. The humectant within Gelair™ Coil and Duct Industrial slows the rate of evaporation of the Tea Tree Oil from the solution, allowing the sterilising and cleaning action to stay active for days after application. Example applications for Gelair™ Coil and Duct Industrial include general cleaning and sterilising; cleaning and sterilising air conditioning systems, including the internal coils and ducts; cleaning grout in bathrooms; removing texta / ink and stains from floors and walls and removing grime and grease from cooking range hood filters. Gelair™ Coil and Duct Industrial is available in two different size options, a 750ml trigger spray bottle or 20 litre refill drums.